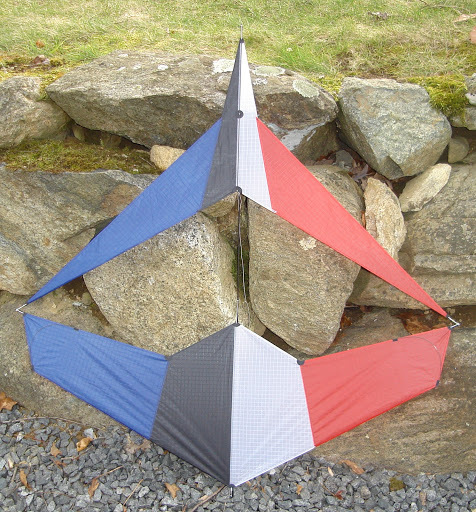 As to my current kiting distractions, the attached picture shows three canard kites I have recently built. The top one is my version of Leong Ceewan's great Plutz kite design. The one on the lower left is a larger version (4-foot wing span) with my preferences for sail shape and a front sail (black in color), which can be removed. And as they say on the old Monty Python show "Time for something completely different," the one on the lower right is my sweep forward canard I call the Arrow. All three glide great. The sweep forward canard kite is a work in progress regarding framing stiffness on the canard wing, which I hope to have resolved when the wind becomes more reasonable. As an update to my efforts in designing and building Canard Single Line Kites, I came across an excellent Excel Program developed by Daniel Prosser. Dan developed the program for model airplanes, but it is applicable to our hobby. Since I last discussed this kite, it now has a light hollow carbon tube center spine and spreaders (1/8" OD) and a custom reinforced center joiner. To connect the spreaders, I had to modify a stock 1/8" yellow center joiner that has 20 degrees of angle, so that it would be strong enough for each spreader to angle forward 10 degrees, while allowing each spreader to bend up towards the tips of the main sail. With a stock 1/8" yellow center joiner, the preexisting center hole was filled with solid carbon rod that was glued in place. The joiner was then rotated 90 degrees, where an 1/8" hole was drilled to accept the center spine through the "V". Two strips of rectangular carbon were glued (thick crazy glue) to each side of the "V". At the ends of the carbon, light line was wrapped and then coated with glue (thin crazy glue). The finished joiner was then painted black because the yellow portion of the reinforced joiner does not go with my sail colors. There are several battens to assist the sails in keeping their shape. There is a 0.05" OD solid carbon center batten in the Canard Sail (Front) as a center spine, which keeps this sail from billowing along the center. 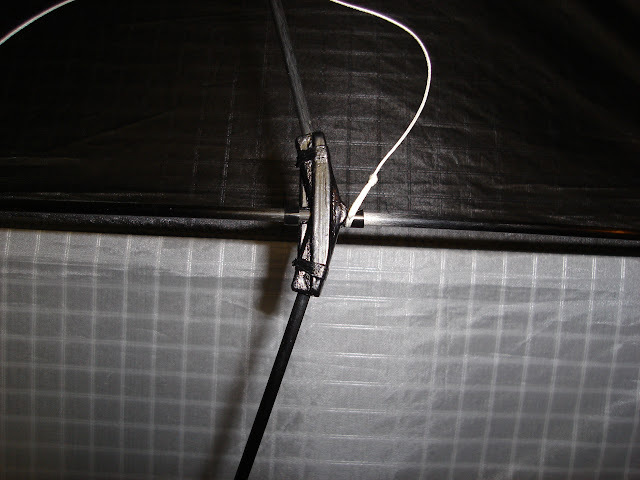 There is also a mid-point line connecting this sail batten to the frame center spine to keep the center part of the sail straight, which you can see in the side view picture. In the Main Sail at the tips, there are two 0.03" solid carbon battens that are curved to keep the tips parallel to the main body of the sail. Due to the neat angle cut in the Main Sail, I had to add two 0.03" solid carbon battens in the seams of blue/black and white/red panels. 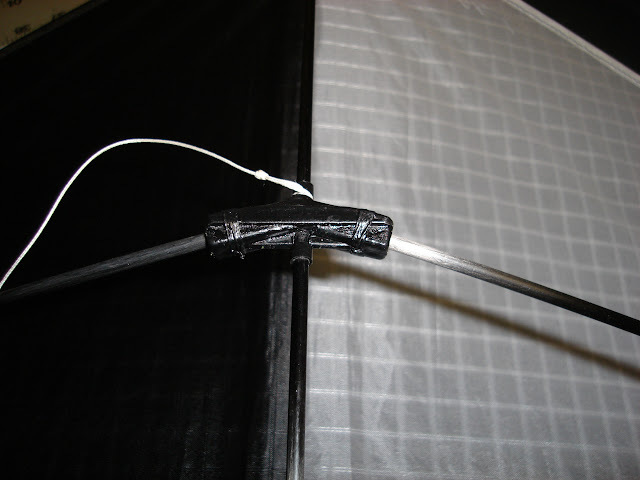 Since I like to make my kites with straight stiches, the battens slide right in from a small hole I made just in front of the trailing edge seam. All of the white connecting lines and bridle line are made from 80 lb. spectra line left over from making my stunt kite lines. I use spectra because it does not stretch and there is a bit of tension on most of the connecting lines. 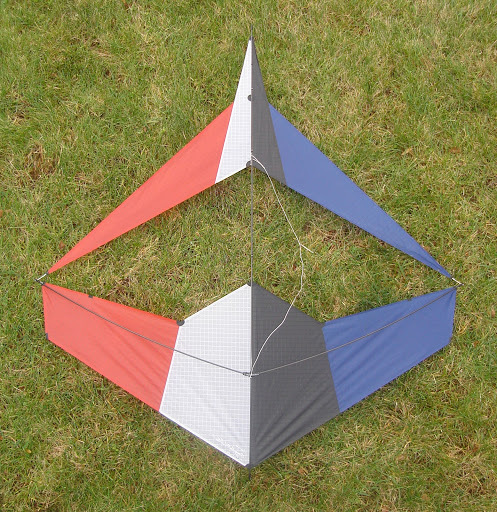 The kite is a blast to fly, and flies like a blend of a Plutz-3/Zero-G and a fighter kite because it spins on a dime. Since I love to tinker, I am experimenting with various locations for the center of gravity, by adding different 1" inch increment lengths of 0.196" carbon tubes over the center spine at the nose. I think I fixed sharing the pictures. Please confirm you can see them. Those work for me now! That is a purty kite!!!! I would love to see detail shots of that center t.
Any flight shots or videos??? I should have some time this Thanksgiving weekend to take and upload more photographs. The photos that are accessible by the provided links are at a good resolution, so if you zoom in, you can see more detail. The following links provide the pictures of the highly modified joiner. Flight pictures to come. So....lots of epoxy/resin....and what looks like a carbon bar? Epoxy/resin would have been too heavy. I just used crazy glue (thick type) to bond the carbon bar to each side of the joiner. The carbon bar has a cross section that is 0.15" x 0.03". I carefully rounded the edges of the carbon strips with sand paper, and then used crazy glue (thin type) to seal the sanded edges. I also used crazy glue (thin type) to bond/saturate the line wrapping the ends. A very thin coat of black paint was applied. The finished weight for the joiner is 2.3 grams. I would have liked it to be lighter in weight, but without the graphite strips, the previous joiner were cracking in the middle due to the load of the curved spreaders. Thank you for making this a separate post. is there that much stress or is the joiner so weak that it needed the reinforcements? It is a very cool kite! was it difficult to sew? Quite a bit of stress since the spreader is not one piece like on the Plutz-3 and Zero-G. I loved the shape of the X-29 Experimental Fighter Airplane, which was the concept behind the rear wing. Sewing was easy for me, but you have to get used to working with small pieces of material and I use narrow (3/16") seams. The black reinforcements are made from dacron. I used ripstop polyester for the sail material. Since the wind has been too strong to get photos of my Arrow Canard Kite, I got the itch to design the next progression of this design concept. The following picture provides the drawing I prepared in AutoCAD, and exported to Microsoft Paint to select the colors (Red, White, Blue, and Black). The template patterns are done and I will start fabrication of the prototype over the holiday break. That is pretty cool Doug. Thanks. I cut out the 8 templates for the 14 panels this morning. It's going to be fun to build. I designed it to use a one piece spreader. Also, I added more sail area to the rear sail to move the neutral point back. The following provides the link to download the CGCalc Program using my new Rapere Canard Kite as an example. To model the curves in each sail, I subdivided the sails in AutoCAD and then measured each panel in AutoCAD. You can see the various panels when you view the Wing and Canard Tabs. After I build the kite over the holidays, I will enter the weight and balance data into the file.